A number of years ago, one of our kids worked for a wholesale florist and gave me many tips on keeping flowers fresh for a longer time span. It’s always worked for me, so I’m passing them onto you. Start with a clean container. I make it a habit to thoroughly clean all my vases after every use. I let it dry completely before storing it away. Use lukewarm water in your vase. To this, depending on the size of your container, add approximately 1/4 – 1/2 teaspoon of liquid bleach and about 1 teaspoon granulated sugar. Mix well. 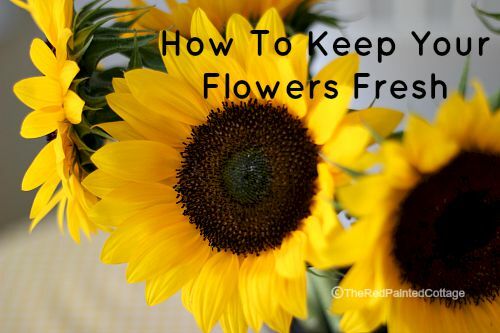 The bleach will prevent bacteria from growing and the sugar helps to keep the flowers fresh. Before putting your stems into the vase, cut each stem at a 45 degree angle and put them one at a time into the vase, after cutting. This helps the stem from closing up and not taking in the water. If you have leaves on the stem that will be submerged once they’re in the vase, take them off. You don’t want any leaves below the surface of the water as they will decay quickly and form bacteria. For my sunflowers, I didn’t have to worry about this. Put your flowers in a place away from direct sun or any surface that might produce heat. If you’re lucky enough to have space in your refrigerator, you can put your vase of flowers in the refrigerator at night and take out in the morning. This will definitely help preserve them. Every day, dispose of the old water and add new water with the bleach and sugar. I also trim (at a 45 degree angle) each stem again, just to make sure it continues to take up the water. If you take all these steps and precautions, your cut flowers will last anywhere from one to two weeks. I’ve joined up with these awesome link parties. I've heard about the bleach and sugar but didn't know the amount, so thank you very much for the words of fresh flower wisdom. 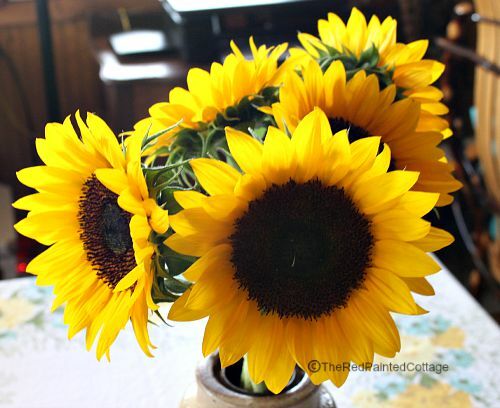 Thanks for all the great tips...love those sunflowers. Wow I love all of these tips for taking care of flowers. Thanks so much for sharing these tips. 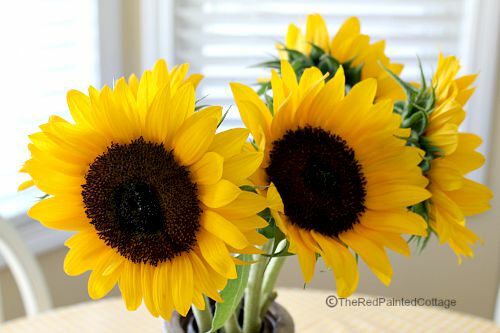 Your sunflowers are beautiful Carol! BTW- I'm now your 98th follower! Sorry to hear you had problems with yours, Shehla. We've NEVER had a problem with sunflowers leaving their pollen around. I know there're different varieties and I always get mine for free from my favorite store for my birthday and our anniversary (Great store, isn't it). Those sunflowers are gorgeous! This is the season I love to have fresh flowers in my house, these tips will be very useful! Especially #6, I've never heard that before! Thanks for sharing at FTAF!